The Army Corps of Engineers created San Francisco’s Treasure Island for the 1939 Golden Gate International Exposition, with plans to turn the island into a civilian airport after the exposition. When the United States entered the Second World War in 1941, the Navy used the island for the Treasure Island Naval Station, where nuclear war training exercises were conducted. The Naval Station was decommissioned in 1993, and parts of the island were transferred to SF for civilian use. Radiation levels on the island are still high, however, and critics charge that the Navy did not do enough to clean the island while downplaying the risks of radiation that still remain. When Don Wadsworth’s company, New World Environmental, was commissioned by the U.S. Navy to survey San Francisco’s Treasure Island for radiation, Navy officials told Wadsworth that they did not expect to find any radiological contamination on the island beyond what the Navy had found in previous tests. The Army Corps of Engineers created the Island for the 1939 Golden Gate International Exposition, with plans to turn the island into a civilian airport after the exposition. When the United States entered the Second World War, the Navy used the island for the Treasure Island Naval Station until it was decommissioned in 1993, and later partly transferred for civilian use. The Bulletin of the Atomic Scientists reports that during his survey, Wadsworth discovered radioactive materials on properties throughout Treasure Island and noted that Treasure Island was not fit for habitation. Robert McLean, another New World Environmental specialist assigned to conduct a preliminary radiation survey, discovered radiation readings from his sensors as he drove through Treasure Island. McLean recorded his findings, which included radium pieces that emitted enough radiation for a person at close range to receive, in an hour, five times the maximum radiation a nuclear worker is allowed to absorb in a year. In 2010, McLean himself received radiation doses greater than allowed by his employer’s guidelines, and was soon fired upon request by the Navy. The new reports of radiation on Treasure Island prompted a battle between California public health officials, who pushed for more examination of radioactive materials on Treasure Island, and Navy officials who claimed there was no need for further radiation examinations. 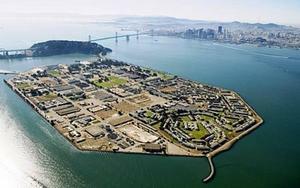 The Center for Investigative Reporting (CIR), as part of a year-long investigation of radiation problems on Treasure Island, examined the Navy’s use of Treasure Island as a testing ground for nuclear war training forty-seven years before the base was decommissioned. A variety of radionuclides — including radium, plutonium, and cesium 137 — were used in training sessions. Today, the Navy is faced with public pressure to deal with Treasure Island’s radiation problem. San Francisco officials responsible for turning the Island over to land developers have conducted a radiation survey on properties on the island, but city officials have been accused of themselves publishing survey results which downplayed the radiation levels on the island. The Navy to date has not publicly acknowledged the high levels of radiation on Treasure Island as recorded by surveys, including those commissioned by the Navy. NBC News reportsthat the Navy is required to assess and clean up the island before selling it to the city as part of a planned $1.5 billion housing development project.